If you’re doing content marketing, your list is worth its weight in gold. You can use your list to send new content, offer a promotion, or build up the relationship over time. Today, I want to talk about how we use email to deliver messages about the 90 day challenge. It starts with a very engaged list of email subscribers – These are the people that really want to know when we create something new. We seed our content with our engaged subscribers, and encourage them to read and comment on the post. When Google and YouTube see that a new piece of content is gaining engagement, it can get pushed up the search rankings. Higher rankings mean more traffic to your content. During the Jeffalytics 90 day challenge we have new video and blog post publishing every day. Some of our subscribers want to read every new tutorial we publish. But others only want to follow our AdWords, Analytics, or Agency Course posts. The last thing we wanted to do was fatigue our 30,000 combined email subscribers with content overload. So, we developed an email delivery process just for the 90 day challenge. This process strikes a balance between staying in touch with our lists and not overwhelming all our subscribers. Today, we’ll show you Behind the Scenes of our email delivery process. Large scale email delivery can get a lot more complicated than just pushing the send button. There are many decision points you have to work through when you start publishing a lot of emails. 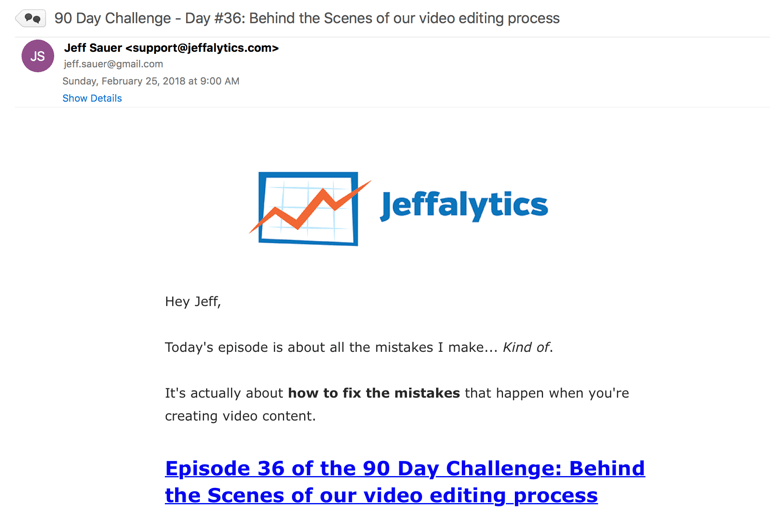 How we sent emails to our lists during the 90 day challenge led to a pretty productive internal debate at Jeffalytics. There were two big decisions our team had to sort out. The first decision was choosing who should receive our 90 day challenge emails. Emailing everyone on our lists for 90 straight days would have likely resulted in a lot of unsubscribes. Or we might have even had all our emails pushed to your spam filter or a folder where would never get noticed. Ultimately, we decided it was best to let people self-select. We created a specific campaign for the day 90 challenge. And our most awesome followers opted into our list… Over 300+ subscribers so far to just the 90 day challenge list counting. Our 90 day challenge email subscribers get a daily email about our latest video and blog post. We also kept a regular weekly schedule for our other lists. In total, we send 11 content related emails out to our lists every week. PPC tutorials go out to PPC Mastery Course subscribers on Mondays. Jeffalytics Deep Dive articles and videos go to our main list every Tuesday. Google Analytics tutorials are sent to our Analytics Course list every Wednesday. 90 day challenge emails are daily. The second big decision we had to make was which email delivery system we should use. Creating 90 broadcast emails would have been an organizational disaster. We would have overloaded our Drip interface with our 90 new emails. And our team wouldn’t have been able to find any of our other work. So, we ruled out broadcast emails. Automation workflows are a great tool for sales funnel emails. But that level of sophistication isn’t necessary for emails that simply share our latest content. So, we decided an email drip campaign was the best way to share our 90 day challenge emails. Note: This is a specific term to our email software Drip, and works differently in other email platform. A campaign system offered the right mix of automation and flexibility. 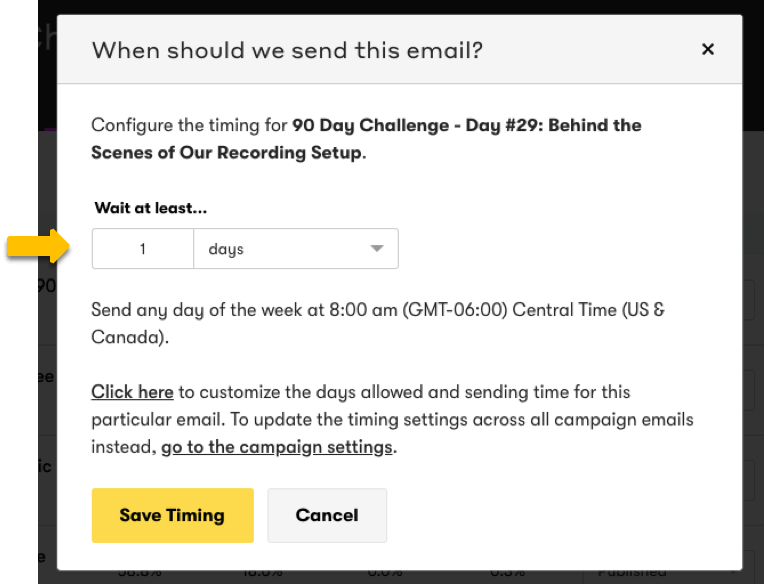 Building our 90 day challenge emails in a this way allowed us to create an evergreen email sequence. In our campaign, every email is delivered sequentially. New subscribers to the 90 day challenge list start on day 1, and work their way through all 90 tutorials. Also, people can unsubscribe from our 90 day challenge list without leaving our main emails lists. Once we had our campaign in place, we needed a way to let people opt into our the 90 day challenge list. We use Thrive Leads to collect email opt-ins for this list and push them into our email marketing tool – Drip. Thrive Leads puts new subscribers directly into our 90 day challenge campaign. Next, we started writing the emails for our 90 day campaign. 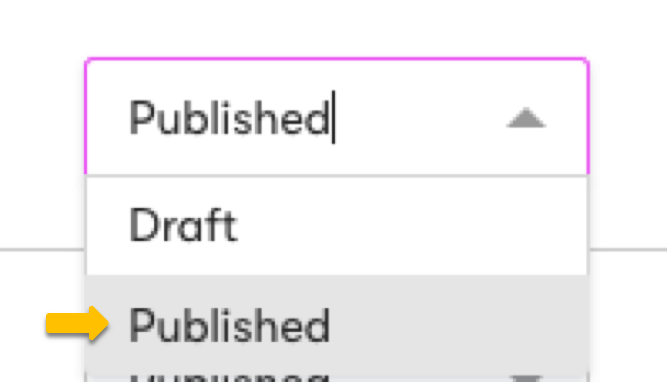 These emails are usually written a couple of days ahead of the publishing date for their related content. Some of the copy in the emails is taken from our posts. But most of the email copy is written specifically for our 90 day campaign. We want our 90 day challenge subscribers to receive a unique message about every video and post. With so many emails going out, we also needed a quality assurance (QA) process. First, we check the source code in the email to make sure there’s no junk in the code. Then, we check all the links in the emails to make sure our URLs are correct. We also send a test email out to our team members. The test email allows us to proof the copy, check the formatting, and recheck our links. After that, we schedule the email and make sure it fits into the daily sequence on our list. Once the email is set to publish, it will deliver as soon as subscribers hit the corresponding step in our campaign. If you’re on the 90 day challenge list you’ll receive our emails at 8 AM USCT… 9 AM EST… 3 PM in Europe… 8 PM in Asia… or 2 AM in Australia. So far, we only broke our process once (the very first day). Since then, we’ve been in a pretty good rhythm. Every mistake we’ve noticed has been corrected for future email deliveries. We intend to use this process for all our email marketing moving forward. But there are also improvements we intend to make once the 90 day challenge chaos calms down. Of course, we’d love to hear your feedback and answer your questions about the process! Are you on the 90 day challenge email list? Or one of our other lists? What do you think about the emails and content so far? Let us know in the comments below. This post and video was episode 64 in our 90 Day Challenge digital marketing series.